The red grape variety comes from Spain. The approximately 100 Synonyms testify to the old age and the wide distribution. The most important of which are grouped alphabetically by country (the other main names are marked in bold) Mataro ( Australia. California ); Balsac Noir, Balthazar, Balzac Noir, Beausset, Bon Avis, Catalan, Clairette Noire, Espagne, Espar, Marseilles, Morvede, Mourvede, Mourvedon, Mourvèdre , Murviedro, Plant de Ledenon, Plant de Saint Gilles ( France ); Negria ( Greece ); Rossola Nera ( Corsica ); Alcallata, Alcayata, Alicante, Benada, Benadu, Berardi, Garrut, Gayata, Gayata Tinta, Mataró , Monastre, Monastrel, Monastrell Garrut, Morastrell, Negrette, Negre Trinchiera, Ros, Tintilla, Torrent, Trinchiera, Verema, Veremeta, Vereneta Spain ). The variety was already in 1381 in Empordà (Catalonia) by the monk Francisc Eiximenis (1340-1409) mentioned together with the Bobal as the main varieties in Valencia. The name probably derives from "monasterio" (monastery). This may be an indication that the variety was first cultivated and distributed by monks. The exact origin is probably the area around the city of Sagunto in the province of Valencia. Sagunto was an important wine port north of Valencia and was called until the year 1877 in Catalan Murviedro, from which probably derives the French main name Mourvèdre. The very late-ripening, low-yielding vine is sensitive to drought, prone to both mildews. mites and Esca, but resistant to Botrytis and Black spots disease, The thick-skinned berries yield strong-alcohol, dark-colored and tannin-rich red wines with aromas of blackberries. The variety is not without problems, because she likes "the face in the sun and feet in the water". So it needs a lot of sunshine, but also good water supply. In any case, it is excellently suited for the Mediterranean climatic conditions with long, hot summers and mild winters. By far the largest amount is found in the country of origin Spain, where it is largely cultivated in the center and along the Mediterranean coast in the southeast of the country. The largest cultivated areas are in Castile-La Mancha with numerous DO areas and in the Levant with the DO areas Alicante. Jumilla. Valencia and Yecla, It serves above all as a Verschnittpartner among other things with the kind Bobal, but is also increasingly being expanded on a varietal basis. In 2010, a total of 58,406 hectares were reported in Spain, with a decreasing trend. Probably as early as the 16th century, the variety was introduced to southern France and called in Provence after the above-mentioned port city of Mourvèdre and in Roussillon after a lying between Barcelona and Valencia city Mataro. She was then in front of the Reblaus- and Mildew disaster It was widely used in France, but was then greatly reduced (in the 1950s there were only a few hundred hectares). In 2010 she finished in the regions Languedoc-Roussillon. Provence, southern Rhone and on the island Corsica a total of 9,257 hectares, with a strong upward trend (ten years earlier it was 7,634 hectares). This rapid upswing also shows the extensive use of the variety in countless French Appellationsweinen. 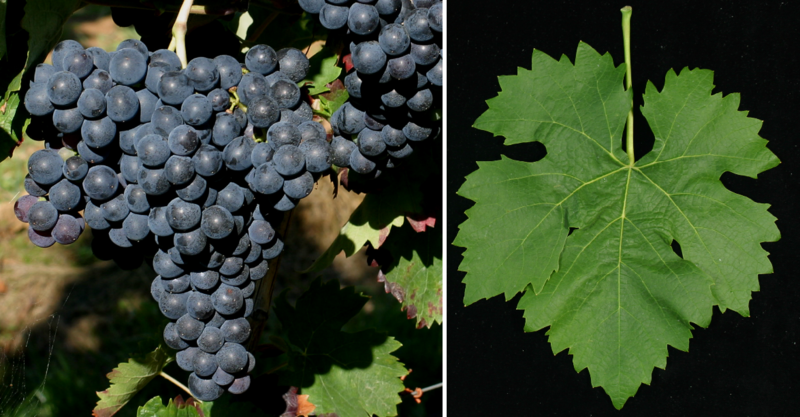 Mourvèdre is often associated with the varieties Carignan ( mazuelo ), Grenache Noir ( Garnacha Tinta ) Cinsault and Syrah blended. Supplementary ingredient is, for example, in the wines of Bandol. Cassis. Châteauneuf-du-Pape. Corbières. Côtes de Provence. Côtes du Rhône. Côtes du Roussillon. Faugères. Fitou. Gigondas. Les Baux-de-Provence. Lirac. Luberon. Minervois. palette. Saint-Chinian. Tavel. Vacqueyras. Ventoux and Vin de Corse, Especially in Languedoc there are also varietal Mourvèdre wines. This page was last modified at 28 March 2019 at 07:10.